This use case shows how to generate actuarial tables with mortality rate and life expectancy for a given set of data. ExposuresSwitzerland.csv counts the Swiss population by age and gender for each year between 1876 and 2009. However, actuarial figures have a predictive value only if calculated on a long enough time interval. We could use the whole 1876-2009 year range, but this would mix too different time periods with very different medical care techniques and plans. We then divided the whole time window in three ranges: 1876- 1900 for the medical ancient times, 1900- 1950 with the new medical discoveries, and 1950-2009 with modern medical care. The previous actuarial figures (mortality rate and log mortality rate) have then been calculated across each one of these three medical ages, replacing the single year with the year range in the formula above. 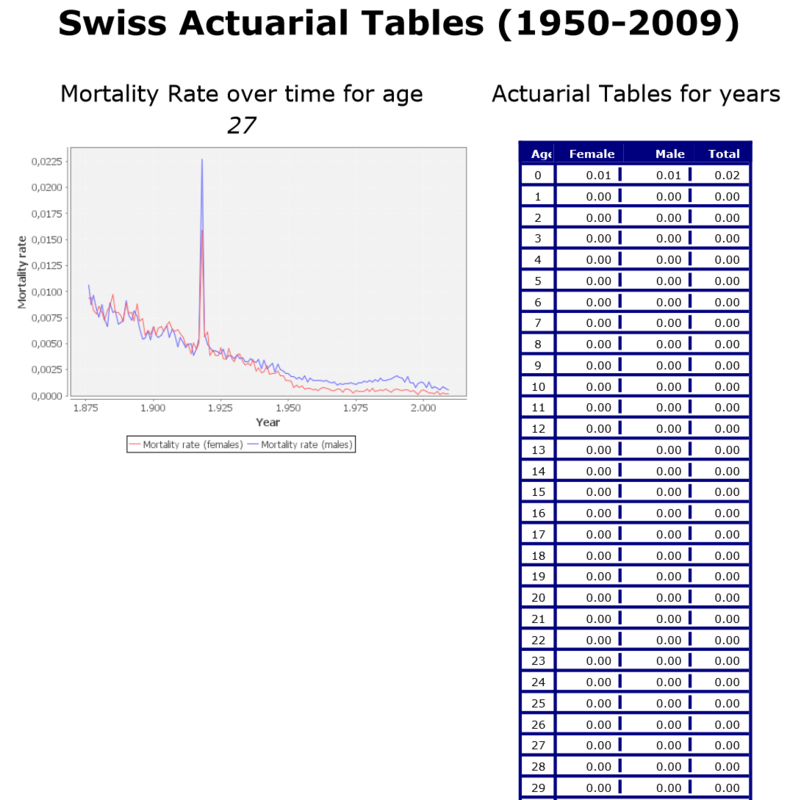 A report that selects a given age value, displays the mortality rate evolution over time (1876-2009) for the selected age, and shows the actuarial figures for all ages over the most recent year range 1950-2009. 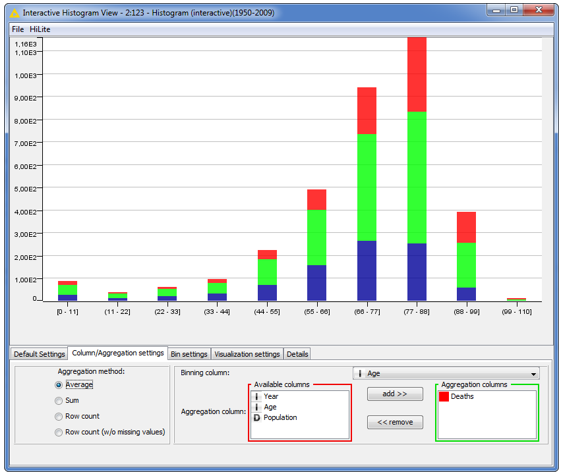 The figure below shows the upper branch of the example workflow, displaying the interactive histograms of the number of deaths for a given age in a selected year range. In order to associate a color to gender (red for female, blue for male, and green for total), the deaths and population counts are split for male, female, and total in the metanode named Metanode. Then a Numeric Binner node builds the three buckets: 1876-1900, 1900-1950, and 1950-2009. Finally, three Histogram (Interactive) nodes show the number of deaths (= aggregation column) by age (= binning column) for each year range. 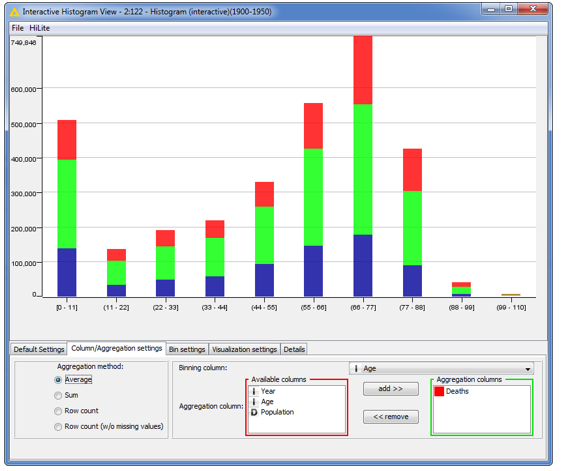 Average as aggregation method produces the average number of deaths for each age bin. Sum as aggregation method would sum all death numbers in each age bin. Below you can see the three histograms for the three year buckets: 1876-1900, 1900-1950, and 1950-2009. Notice the progressive reduction in death count over the first year of life and the progressive increase for the latest age bins across the three histograms. We also introduced an Interactive Table node to find specific groups of records. For example, it could be interesting to isolate the death counts of the few centenaries before 1900. 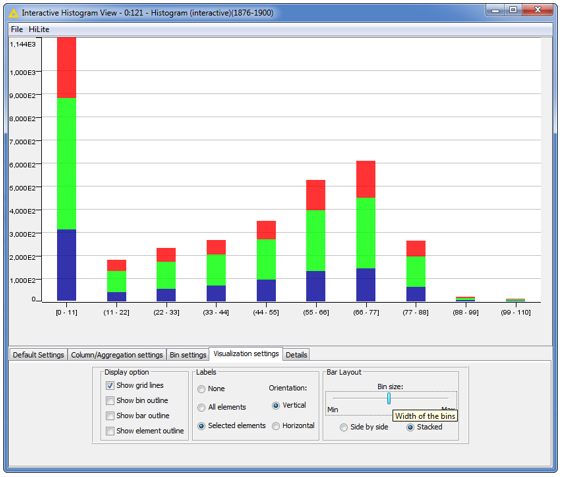 By highlighting (Hilite -> Hilite Selected) the last bar in the 1876-1900 histogram and selecting the option Hilite -> Filter -> Show Hilited Only in the Interactive Table view, we get the table below with the full extract of death counts for ages older than 99. The “Actuarial Calculation year_range” metanode specifically calculates the total number of deaths in each year range for each age value (GroupBy node), then calculates the Mortality Rate and the LOG Mortality Rate for each age with two Math Formula nodes (see figure below). Similarly the “Actuarial Figures M/F” metanode uses two Math Formula nodes for the mortality rates calculation: one for the male and one for the female population. Notice that the “Actuarial Selection” metanode contains a Value Selection Quickform node to select the age value. This Quickform node produces the age selection menu in the configuration window of the metanode, as shown below. The last figure shows the final report with the mortality rate trend for age 27 and the actuarial table for the most recent year range.